Inspired by a fellow artist, W. Bradley Elsberry, who created a dress made from eucalyptus bark. His creation sparked an idea that became this painting. 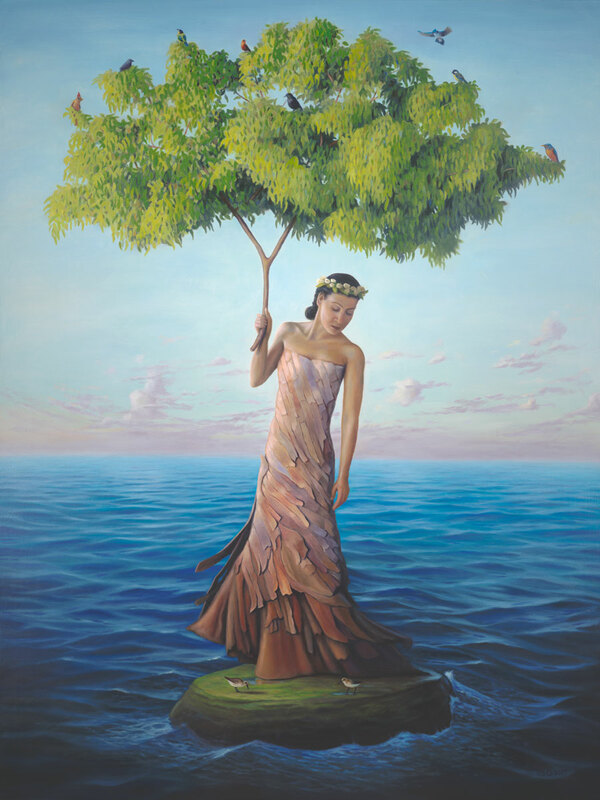 The woman serves as respite to the birds flying in mid-ocean. All of us have some place or person that serves as our personal sanctuary. It may be a lover, a child or a parent, home, God, or a combination of all of these. It is a place where we know we are safe to be our true selves without fear of judgement. And in that safety we are free to grow and flower. For me this painting also relates – as many of my works do – to the relationship with my wife, who magically appeared as my personal island of sanctuary during a particularly heavy open-ocean crossing.